I am trying to draw internal block diagrams like one shown at docs.nomagic.com/display/SYSMLP190/SysML...k+Definition+Diagram . I attempted this on Modelio3.7, without luck. In earlier versions of Modelio, I could convert a block to structured representation and could add blocks within another. I don't find the option to do this anymore. Is there a way of working around this problem. Last Edit: 1 year 1 month ago by ebr. 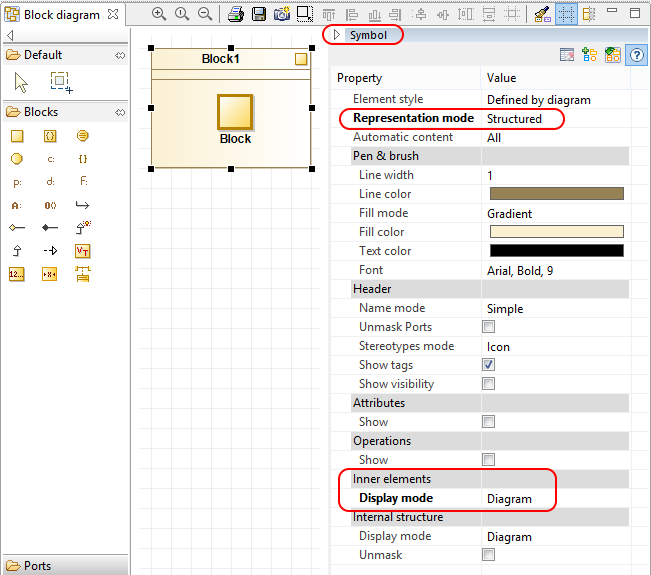 The "Symbol" tab used to change the representation mode of diagram elements has been moved from the 'Properties' tab to the diagram itself. See Setting graphic options for diagrams help page for more details.